The term "Buyer” refers to the consumer, i.e. “natural person” who makes the purchase object of this contract for purposes that are outside his/her trade, business or professional activity (if any). The term "Supplier" refers to the person that provides the goods specified in this contract. The goods and services covered by these terms and conditions are offered for sale by Paolo Lazzaroni & Figli SpA, Via Gorizia n. 41, Saronno VAT and Companies Register of Varese No. 184588. The Buyer, by sending a purchase order confirmation via computer, unconditionally accepts and agrees to comply with the general terms and payment conditions set out below during his/her relationship with the supplier; the Buyer also declares to have read and accept all the information provided, pursuant to the provisions mentioned, and also acknowledges that the Supplier is not bound by any other condition unless previously agreed in writing. These Terms and Conditions of Sale must be examined online by shoppers visiting the site, before they confirm their purchases. The submission of the order confirmation implies full knowledge and acceptance of the General Conditions of Sale. The Buyer agrees and undertakes, after having completed the online purchase procedure, to print and keep these Terms and Conditions of Sale, already read and accepted during the purchase process, in order to fully comply with the provisions provided for by articles 3 and 4 of Legislative Decree no. 185/1999. Personal data requested during the registration process is collected by Paolo Lazzaroni & Figli S.p.a. and processed electronically and / or by hand for the sole purpose of complying with the obligations arising from any agreement entered into with the Customer and shall not, under any circumstances or in any way be transferred to third parties. Paolo Lazzaroni & Figli S.p.a. guarantees Customers the respect of regulations on the processing of personal data governed by the Data Protection Code provided for by Legislative Decree no. 196 of 30.06.03. The data controller is Paolo Lazzaroni & Figli S.p.a. Via Gorizia n. 41, Saronno , namely the legal representative, unless a manager is appointed pursuant to art. 29 of Legislative Decree no. 196/2003. The Customer has the right, at all times, to retract the consent to the processing of personal data, by writing to the registered office of Paolo Lazzaroni & Figli S.p.a. The goods under these general sales conditions are sold by Paolo Lazzaroni & Figli S.p.a., with registered office in Saronno (VA), Via Gorizia n. 41, registered with the Chamber of Commerce of Varese under No.184588 of the Companies Registry, tax code No. 01470360122 and VAT number: 01470360122. The contract between Supplier and Buyer shall be entered into exclusively over the Internet. To submit a purchase order for the goods available for sale, Buyer must access our website and follow the instructions contained therein. The purchase contract shall be deemed executed when an order is placed by Buyer through our online order form. The order summary can be viewed on the relevant web page, and shall contain the following details : Buyer’s personal data, order details, price of purchased goods, delivery charges, payment method and terms and delivery address. Upon receipt of the Buyer’s order, the Supplier shall send a confirmation e-mail and/or direct Buyer to a printable web page containing the order summary along with the data quoted in the order form. The contract is deemed to be entered into and effective only upon execution of the order and the issue of the relative tax receipt or invoice. Until then, Supplier has the right to refuse the order. Credit card data is managed directly by Banca Sella or other banks specialized in online payments, whereas, PayPal data is managed directly by PayPal. Personal data is protected by means of next-generation encryption systems that prevent unauthorized use of such data by third parties, and is forwarded directly to the bank. Supplier reserves the right to request authorization from the credit cart issuing bank or PayPal to verify ownership and authenticity of the credit card in case problems are encountered. Under the right circumstances, refunds will be made to Buyer by transfer of credit card payment, within 30 days from the date on which Supplier became aware of the causes that gave Buyer the right to claim a refund. 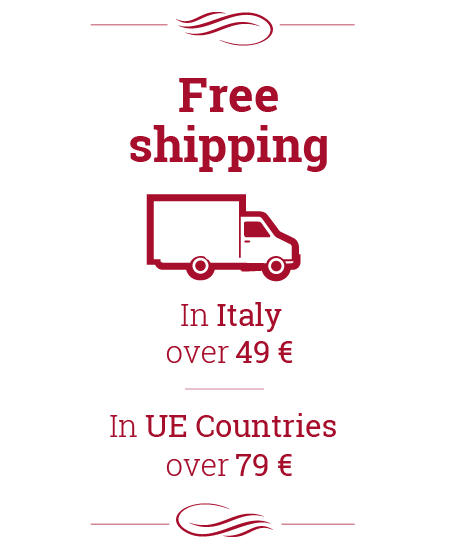 In Italy delivery is expected in about 3-5 days. For more information on the timing of delivery and the Expedition, please see the section "Shipping" at the bottom of the site. f an order cannot be executed within the terms under this contract due to force majeure events, Supplier shall not be held liable for any ensuing problem or loss suffered by Buyer. Supplier shall not be held liable towards Buyer, save for cases of wilful misconduct or gross negligence, web failure or malfunctions beyond Supplier’s or sub-suppliers’ control. Also, Supplier shall not be held liable for any damage, loss or extra charges suffered by Buyer in the event of failure to execute the contract due to causes not attributable to the same, given that Buyer is only entitled to claim refund of the full price paid for the product. Supplier shall not be held liable for any fraudulent or illegal use - by unauthorized third parties - of credit cards upon payment of the purchased products, provided Buyer is able to prove that all possible precautionary measures were taken according to the standards of ordinary diligence. Supplier shall be held liable for any ascertained defective or faulty products attributable to the same, provided that such defects have been notified to Supplier via registered mail with return receipt sent to the following address: Paolo Lazzaroni & Figli S.p.a., Via Gorizia n. 41, Saronno (VA) within 8 days from the date of delivery of the purchased goods. All written communications addressed to Supplier, including any complaints, shall be deemed valid only if sent to the following address: Paolo Lazzaroni & Figli S.p.a., Via Gorizia n. 41, Saronno (VA), or by e-mail to the following web address: info@chiostrodisaronno.it Buyer shall state in the order registration form his/her place of residence and domicile, telephone number and e -mail address for receiving communications from Supplier. Any disputes arising out of or in connection with this contract shall be settled by the competent court of Busto Arsizio, in case the Parties agree to submit such disputes to an ordinary Court. The confirmation of the order implies acceptance by Buyer of these general sales conditions terms. Updates and changes to these terms and conditions are effective from the moment they are published on this website. Any change or update to these terms and conditions shall be deemed valid and effective for orders that are yet to be filled out and for which the relative summary page is not yet displayed or printed out. To withdraw from the agreement, the Buyer may use the return form (in conformity with the form pursuant to Article 49, paragraph 4 of the Consumer Code); the form must be filled in and sent to the Seller by e-mail at assistenza@chiostrodisaronno.it, the customer may also write and send to the Seller a declaration stating the decision to withdraw from the agreement. After having withdrawn from the agreement, the Buyer must return the products to the Seller, handing them over to the carrier for shipment within 14 days, starting from when the Buyer notified the Seller of his/her decision to withdraw from the contract. , the Buyer shall directly pay the costs to return the goods and shall be liable in case of loss of or damage to the products during transport. the goods must not be damaged. If the right of withdrawal is exercised in the manner foreseen, the Seller shall check the conformity of the returned products and shall refund the amount due within 14 days from the date on which the Seller becomes aware of the exercise of the right of withdrawal by the Buyer.